The Edmonton Valley Zoo has received a "dishonourable mention" from an organization that created a list of the 10 worst zoos for elephants in North America. California-based animals rights organization In Defense of Animals (IDA) releases the list annually, highlighting the alleged mistreatment of animals in captivity. "If there's one entry on our list that just won't go away, it's Edmonton Valley Zoo," said IDA elephant scientist Toni Frohoff in a release Tuesday. "Here, poor Lucy, an Asian elephant, lives a lonely life of solitary confinement in a bone-chilling prison in one of the coldest cities in Canada." 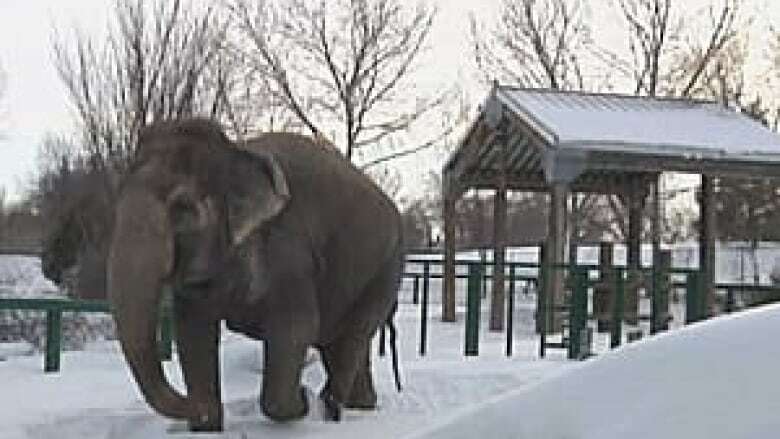 The Edmonton zoo didn't make the 10 worst list, but was highlighted for its treatment of long-time resident elephant, Lucy. It was the only Canadian zoo mentioned. Zoo director Denise Prefontaine countered the group's claims, saying the animal rights group is spreading false information. "We take a lot of exception to the fact that they continually misinform the public about what we're about and how we look after our animals," Prefontaine told CBC News. "We have been taking care of this animal for 40 years," she said. "We have a really dedicated team." The back-and-forth between the Edmonton zoo and animal rights groups is a debate Edmontonians have been hearing for years. In 2012, an animal rights group failed to appeal to have Lucy relocated. The group called for the movement of Lucy to a warm weather wildlife sanctuary, but the Supreme Court of Canada decided not to hear the appeal. Six years later, activists continue to push for the relocation of the 42-year-old elephant. "Lucy still suffers from health problems, which most — if not all — could be ameliorated with transfer to a warm weather elephant sanctuary," Frohoff said. Prefontaine argued that Lucy doesn't need to be moved somewhere warmer. "We don't keep her outside," she said. "She is not in the cold weather for extended periods of time." Instead, she moves between two heated barns. Prefontaine said the barns are a five-minute walk apart. In Defense of Animals also said Lucy should be moved to a sanctuary so she can interact with other elephants. But Prefontaine said Lucy doesn't need their companionship. "We have seen instances where she has been with other elephants that, really, she doesn't understand elephant dynamics. She doesn't know how to interact with them. She doesn't know how to behave as part of a herd," she said. "It's very stressful to her." And Lucy doesn't handle stress well. The elephant has a respiratory problem that flares up in stressful situations, making it difficult for her to breathe, Prefontaine said. As a result, moving Lucy could kill her. "We're not willing to take that risk with her," Prefontaine said. The zoo has repeatedly made this statement over the years, culminating in a 2016 welfare assessment by elephant expert John Cracknell. "The respiratory pathology would not make transfer impossible but it would be highly likely to carry the risk that she could potentially die on route," Cracknell said in the report. Prefontaine said several other experts support this statement. Despite the repeated affirmations about the risk of moving the elephant, the Edmonton Valley Zoo continuously ends up on or near the worst zoos list. It landed at number four last year. "I think it's part of an agenda — an activist agenda," Prefontaine said. "It's just part of what their philosophy is and what their beliefs are. And I think they'll continue to raise it as long as elephants are in zoos." The Edmonton zoo took in the elephant in 1977 as a two-year-old orphan. Lucy was raised by people, and Prefontaine said the elephant shares a deep bond with each of her keepers. "Her herd here is really important to her," said Prefontaine, who has known Lucy for 25 years. "Lucy is special," Prefontaine said, tearing up. She said Lucy is a calm, content and well-adjusted elephant that is part of a "special family." "When you see her with her keepers and how she recognizes them and how she interacts differently with each one — it's fascinating," she said. "And I'm really proud to be one of her herd."